I was sent this book by a kind minister of the gospel in the USA. Had he not sent it, I may never have got around to getting hold of it and reading it – and I am very glad that he did send it! Stephen Mansfield is a well-known author of factual and historical books in the USA, and often looks at the role that faith plays in the lives of politicians. He took some flak from Christians for writing a book entitled ‘The Faith of Barack Obama’, (not that he agreed with the President’s faith, he simply documented it, but many saw it as an endorsement) and seeking a less controversial topic, he moved on to write this survey of the endeavours of Arthur Guinness, and the empire he founded in 1759. What many people do not realise is the enormous role that Christian belief has played in the Guinness family. At the beginning, it seems to have been the patronage of an Archbishop that enabled Arthur Guinness to study and to go into business, and he himself was a committed protestant in the established church. Most interestingly, his life overlaps with the time of the Great Awakening, and he heard John Wesley preach in Dublin. While it is speculation to an extent, his life of generosity and commitment to the wellbeing of all (he was a firm advocate of rights for Roman Catholics at a time when they were oppressed in Ireland), and his being the founder of Ireland’s first Sunday Schools, speaks much to there being a reality behind his formal church attendance. There is so much which could have been written that doubtless Mansfield may have produced a book four times the size, but it would never have found a popular readership. It does, perhaps, leave the serious historian a little disappointed – but what is done is done very well. He traces the growth of the business, and illustrates along the way the extent to which Christian values shaped the attitude of the company towards its employees and the wider public. By the 1920s, Guinness employees enjoyed benefits which were arguably greater than any ‘shop floor’ employee working in 2013! Arthur Guinness had several children, and the family branched out. In the book, the family is shown to have three major directions of vocation in life – Brewing, Banking, and the Christian Ministry. What Mansfield does superbly is to illustrate that all of these occupations were of spiritual and social value. The idea that ‘full time Christian service’ is somehow a superior occupation to that of a retail worker, a factory worker, or even a doctor or lawyer, is a pernicious one with no basis in Scripture. All work in this life may be done to the glory of God, and we desperately need to recover the lost understanding of vocation for all Christians. Martin Luther is quoted as saying ‘household chores are more to be valued than all the works of monks and nuns’. The vast social good done by the Guinness family, especially in social housing, is hard to measure. Yet, it would not have been possible without the profits made from the sale of alcohol. To some Christians, this is a no-go area. Yet it was not always so, and Mansfield illustrates readily how Guinness porter was intended to promote health and reduce drunkenness, not to increase it. I believe that this book represents a powerful challenge to those who claim that Christians should not drink at all. The Bible teaches that alcohol is a gift of God to be used in moderation, and where it has been, the blessings and benefits have been great. It is perhaps not ludicrous for a relative of mine to speculate upon whether the great decline in Christianity in the UK had anything to do with the majority of Victorian Christians turning against alcohol and simply removing themselves from the social lives of their fellow men. Perhaps the most inspiring part of the book, though, is the account of one of the founder’s grandsons, Henry Grattan Guinness. Henry grew up to be a great evangelist, and ‘such a firebrand of faith in his time that his name would be mentioned with Dwight L. Moody and Charles Haddon Spurgeon as one of the greatest preachers of his age’ (p169). The power of God in upon his life and ministry was immense, and one of the men he would go on to inspire and to mentor was none other than Dr. Thomas Barnardo. He also played a great role in the support of Hudson Taylor, the great missionary to China. Henry was, it must be noted, teetotal. If you love the Lord, your heart will thrill to read of all that He accomplished through His faithful servants, some working for Him mainly in the secular world, and others exclusively in the church, but all men and women who worked for the glory of God. By no means all of the family were righteous, or people of faith, but the biblical and moral principles by which business was conducted, and employees were treated, have much to teach us today. I wholeheartedly commend this book. You may not agree with everything in it, but I trust that as you read it you will give thanks to God for all that He has accomplished through the honest endeavours of those who have sought to follow Christ along several vocational paths. If this book might firstly educate us a little on the history of alcohol (apart from the wild claims of fundamentalist pamphlets), and secondly inspire all of us, but especially the young, to go out in our vocations and seek to make a difference in Christ’s name, and thirdly and finally cause us to give glory to God, then it will have been worth every second you invested in reading it! Occasioned by the 200th anniversary of the church now known as Bethel Evangelical Free Church, Hanley, this enjoyable book is a rare treat for those such as myself who enjoy learning more about British nonconformist church history. It might seem unlikely that those with no connection to the church should find the book interesting, but it certainly is, because Mr Charmley has not provided us a black-and-white sketch, but a full colour painting. Whilst it could be argued that sometimes he digresses a little too much, the amount of information available certainly gives an understanding about the changes, over time, in the church which was originally known as ‘Hope Chapel’, a congregational church. 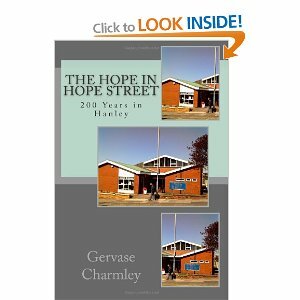 Mr Charmley writes with a lively, conversational style, and is unafraid to express his own biblical convictions throughout. One particular feature of the book is the amount of light shed on the remarkable ‘Bethel Evangelistic Society’, centering on the ministry of Stephen Jeffreys, its founder, and his son Edward. Largely Pentecostal in their views, it is clear that there was a considerable time of blessing experienced as many churches were founded, and in the case of the church in Hanley, ‘brought in’ to the family of churches. This book, which gives glory to God for the continuation of a witness on Hope Street when most other churches in the area have closed, leaves you with the clear impression that where the gospel is truly valued, and the central doctrines of protestant faith are maintained without compromise, the Lord will faithfully own them – whatever secondary doctrinal issues are, or are not, the ‘flavour of the month’. Mr Charmley is to be congratulated for his careful research and helpful analysis. If you are interested in Congregationalism, Early British Pentecostalism, or indeed the general state of British Evangelicalism in the 20th-21st centuries, there is much in the book to divert and educate you. This could have been an introverted and very parochial volume. It is not, and I hope that many others will enjoy it as much as I have. Do you still need convincing? The account of two ministers who fell off a pavement while discussing Bible versions in the middle of the night is worth the cover price alone! While this book might not be an easy read for all ability levels, I am sure that it is a deeply useful one for all who are willing to make the effort! You can buy the book here or for Kindle here. Just a quick note to announce that the ‘Morton Messenger’, the complete monthly magazine of which the ‘Pastoral Letter’ is just a part, is now available as a PDF file. There is a monthly email distribution, so if you would like to receive ‘The Messenger’ in complete form, please email mortonbaptistchurch@hotmail.co.uk with your request.